According to the World Health Organisation (WHO), about 15% of the world's population lives with some form of disability. The number of persons with disabilities is increasing due to medical developments, the rise of ageing population and the spread of chronic diseases. This large population, which is already marginalised, is at risk of being further excluded if accessibility and inclusion are not considered while designing the smart facilities and services. Whereas, the pan-city proposal comprises of a city-wide ICT based solution aiming to resolve various urban problems. The purpose of the Smart Cities Mission is to drive economic growth and improve the quality of life of people by enabling local area development and harnessing technology, especially technology that leads to Smart outcomes. So far the proposal for 60 cities has been selected in Phase 1 & 2 and 40 cities are yet to compete in the next round. Now, the implementation is in the hands of the State government and the allocated Special Purpose Vehicle (SPV) for the top 20 cities whose funding has been already allocated. The mission finds few mention of disability in the overall process, although there is no certainty to ensure their incorporation in each city's proposal. Cities like Udaipur have incorporated the features for disability whereas cities like Jabalpur find no mention for the disabled population. The top 20 winning cities have completely neglected the role of digital inclusion for persons with disabilities in their proposal. While several of the city proposals talk about disabled friendly pathway design or barrier free walkways, almost all of them have neglected the access to IT enabled solutions like e-governance and citizen services. The mission with its notion of inclusiveness fails to integrate disability as a key issue in the smart city proposal. The mention of disability under the mission statement and guidelines only lie on the part of citizen consultation which has failed to ensure the component of universal accessibility in every proposal. The proposals of top 20 winning cities paint a poor picture in the inclusion of disabled population in above elements. They are invisible and excluded in components like safety and security, health, education, e-governance, affordable housing, etc. Cities are moving towards advanced, digital or smart services yet the disabled population has to struggle hard to achieve basic needs, widening the social stratification. Poverty and disability are complementary; former cannot be alleviated without addressing the later as a key issue in the mission. In December 2015, the Prime Minister of India launched the Accessible India Campaign (AIC) for making India accessible for people with disabilities. However, after a year of its launch, it seems like an isolated campaign of Ministry of Social Justice and Empowerment (MSJE) with a very limited vision. 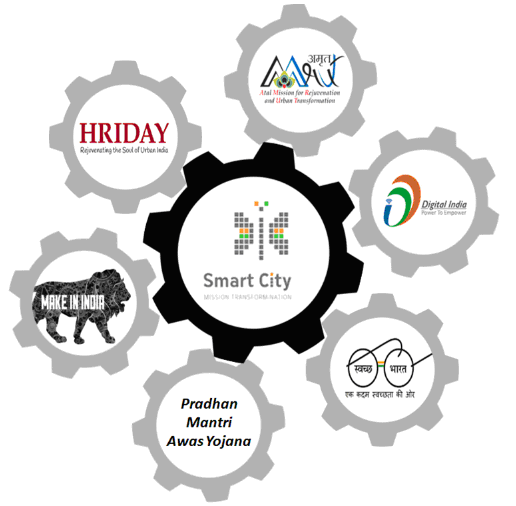 The Smart Cities Mission focuses on a comprehensive development leading to the convergence of other ongoing government programmes like Make In India, Digital India, AMRUT, Pradhan Mantri Awas Yojana, HRIDAY, etc with the smart city projects but Accessible India Campaign finds no convergence. Similarly, the smart solutions of the basic infrastructure including core and IT enabled find no mention or ensure proper accessibility and digital inclusion to all these services for persons with disabilities apart from the consultation. Although the evaluation criteria mention their accessibility but as seen from the proposals there is no way to make certain that these solutions like public information and electronic service delivery would be accessible for people with visual or hearing disabilities. Lack of awareness regarding e-accessibility for persons with disabilities by the stakeholders. Lack of data or guiding policies/principles on persons with disabilities. Poor project execution leading to the failure to incorporate features for persons with disabilities. Smart city proposals that lack accessibility features from the beginning of the mission. No benchmarks for accessibility features like other services. Our cities are profoundly unequal places and disability is increasingly an important urban struggle, especially in ‘service’ and ‘being part of city’. (Steven Friedman) The mission should be seen as an opportunity for the upliftment of persons with disabilities rather than making them more vulnerable by excluding them from the Smart City services. Along with the built environment, technology is a key enabler in the mission and is a major means to achieve the ends of the mission. Initiatives are needed to be taken in the current stages of the mission so that this exclusion does not come up with a big price both socially and economically in the future. Internationally, there are initiatives being undertaken to develop guidelines, standards and tools for making Smart Cities inclusive for persons with disabilities. These tools should be adopted and implemented. Accessibility of persons with disabilities should be included in the Smart Cities Mission in India and relevant tools should be adopted in the Indian context along with building the capacities of all the stakeholders.